It seems as though yearly you'll see big improvements within the wonderful world of storage tyechnology, either it becomes fast or there's a bump up in storage capacity. 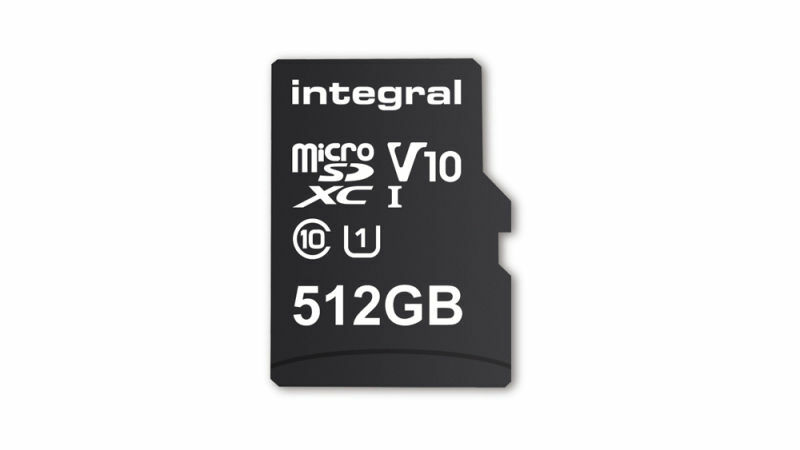 Case in point, we have Integral Memory who are major players in the microSD storage industry has introduced the 512GB microSDHC/XC, which notably is the world first to crack that storage barrier, overtaking the previous capacity champs, SanDisk 400GB Ultra microSDXC card. This great for those who store a ton of data content on mobile devices that includes smartphones, laptops and cameras. "Consumers have been clear in their call for increased storage, as mobile devices have become essential to many in everyday life. "The need to provide extended memory for smartphones, tablets and a growing range of other mobile devices such as action cams and drones has been answered. As a company, we are very proud to be the first to achieve the 512GB capacity milestone in microSDXC, worldwide." In response to the above quote, their point is well taken in that the smartphone camera have advanced in image technology that's capable capturing ultra-high resolution images and record video at 200fps, which adds up to massive amount of storage spaced being depleted. The data transfer speed numbers for the new 512GB capacity card goes as follows, 80MB/s which is a bump down in speed from the SanDisk Ultra which have a rated speed in upwards of 100MB/s. The Integral Memory card have a UHS-l Class 1 specification, which meets the Video Speed Class 10 (V10) standard for video transfer performance. There is no definitive price point on the Integral 512 microSDXC card as of yet, but if want to use the SanDisk 400 as a price reference it cost $242 on Amazon. Availability is expected to take place next month, and will be back by a 5-year warranty. Jan 29 Explanation Needed: Why Does Your Computers Processor Get Hot?